26. The hubs gave me a rough draft of a book he’s creating of all my blog posts from last year. This sweet man has poured hours preparing it and it is a family treasure. 27. For the first time in my life, I got a birthday card from Charles. Charles is the quirky alter ego of my orange hair, freckle face OS. Charles spawned an alter ego in me named Charlene. Charles and Charlene speak their own language and have unique accents. No one else in the family really likes Charles and Charlene but we/they have fun together. Thanks Charles! 29. For my birthday, I also received a beautiful letter from my oldest OS. And, just like Nate, he forgot to sign it! 30. Thread – I have new thread. Thread makes things happen. Oh yeah. 31. We entertained a Korean exchange student during my birthday weekend and she made us bibimbap and other tasty Korean foods. 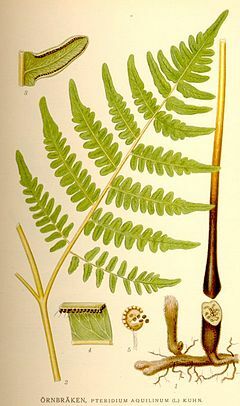 And I’ve now eaten bracken…you’re welcome. 32. My soap nuts arrived. I’ve been using them for two weeks – love them, seriously! 33. 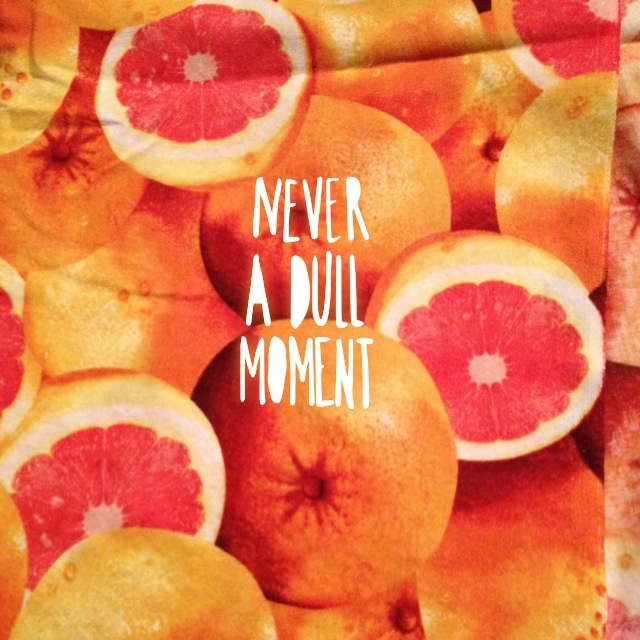 I finished a guest blog post – taa daa! 34. At the end of my birthday night, my middle OS Aaron gave me a video of the past year. I cried through the whole thing but only had one big crying snort, it couldn’t be helped. 35. No snow or ice storms on my birthday. For someone born January 27th in the States, those things usually go hand in hand. a mama of oliveshoots needs olive fabric. but now what do I do with it? 36. My road trip to MaryJo’s Cloth Store with friends was joyful. Four women in an SUV talking about everything without gossip is a blessing. 37. I bought some 1 1/2 yards of olive fabric. Any suggestions on what a mama of oliveshoots can do with this? 38. I have three pounds of dried black turtle beans. They are exquisite. 39. My birthday cake from Blue Moon Bakery – simply divine with raspberry frosting, chocolate mousse filling. And it matched my hair. It’s good when your hair matches your cake. 40. But before we enjoyed the bakery cake on Saturday with my extended family on Friday night, a wonderful family friend surprised me with a homemade pound cake she made from scratch. 41. Ike’s team won their game! My orange hair, freckle face OS blazed the court on my b-day! 42. My mom does not have cancer. 44. A singing birthday greeting from my cousin’s family. Tis a sweet melody hearing four girls who love the Lord leave a message for me. 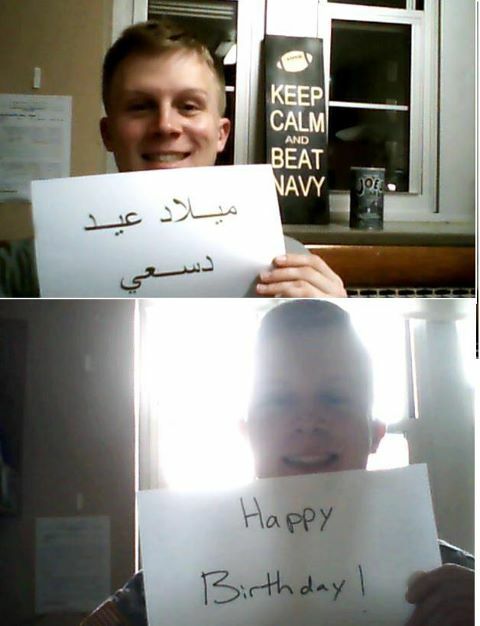 45. another birthday announcement from my cadet – in Arabic and English! I’m pretty sure his roommate helped him with the Arabic. pj pants for a book lover! 46. 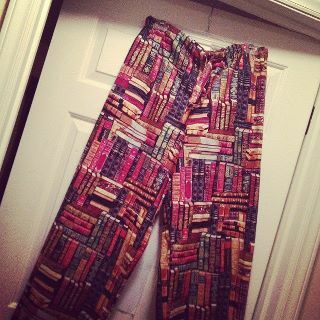 I made a pair of pajama pants for one of my two bibliophiles. He’s going to wear them during Spirit Week. 47. Jesus who gave me a redemptive life. 49. Lou Malnati’s pizza from my aunt and uncle shipped from Chicago which necessitates blessing #48! 50. 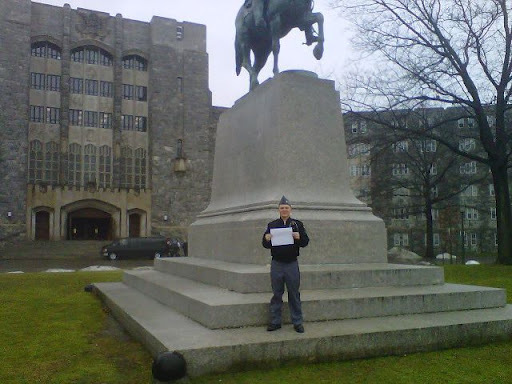 And lastly, another birthday greeting from my Soldier. I know this was no small feat for my OS to do, thank you precious son! Oh how I love Spirit Week! I love it so much, if it were up to me, every school would have a Spirit Week just for parents. There was no Spirit Week when I was in middle school or high school so I live through the SW of my OS. Yes, according them, I’m kind of like a stage mom when it comes to Spirit Week. With Aaron’s medical struggles, there was less parental involvement in Ike’s SW this year. 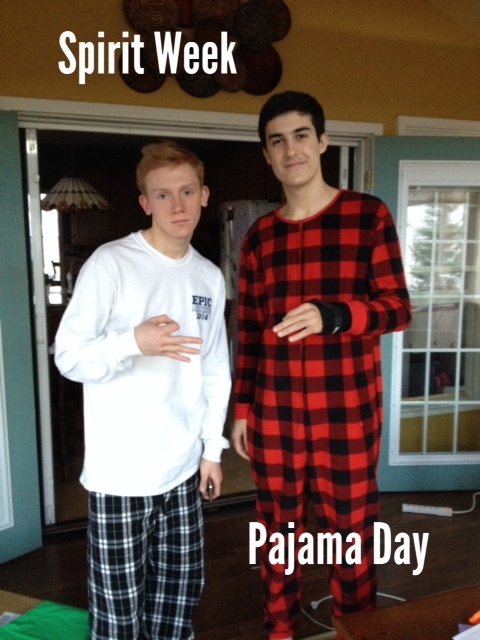 This resulted in my orange hair, freckle face OS wearing a pair of store-bought pajamas on Pajama Day. We had even picked out special material six months ago for me to make just for him. 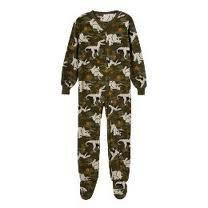 Alas, Ike decided he wanted to show off these pajamas. 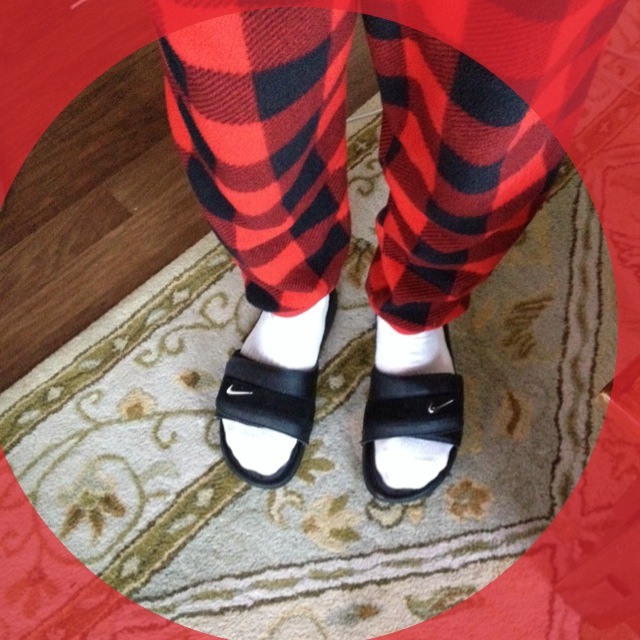 He won a gift certificate because of his footed sleepwear. 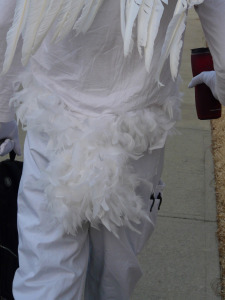 But now that my middle OS is feeling so much better, nearly all of my parental energy pours into Spirit Week 2011. 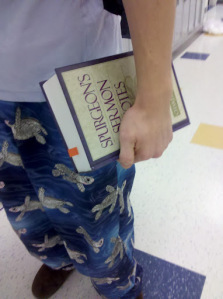 Monday morning, Aaron pranced into school wearing his designer-made sea turtle pajama pants. I wanted to create a sea turtle applique for the t-shirt but he sternly spurned my suggestion. Tuesday was Animal Kingdom Day. Last year my middle OS was a pupa. We twirled yards of brown toile around Aaron to encase him. Then in the middle of Mrs. Davis’ Spanish Class, Aaron asked if he could go to the restroom. When Aaron returned he had metamorphosed into a beautiful, extremely large butterfly ~ He wore his grandpa’s really yellow golf pants and custom-made wings. We thought this was an apt description of adolescence and doesn’t every teenager want to be reminded of puberty on Animal Kingdom Day? I thought so! 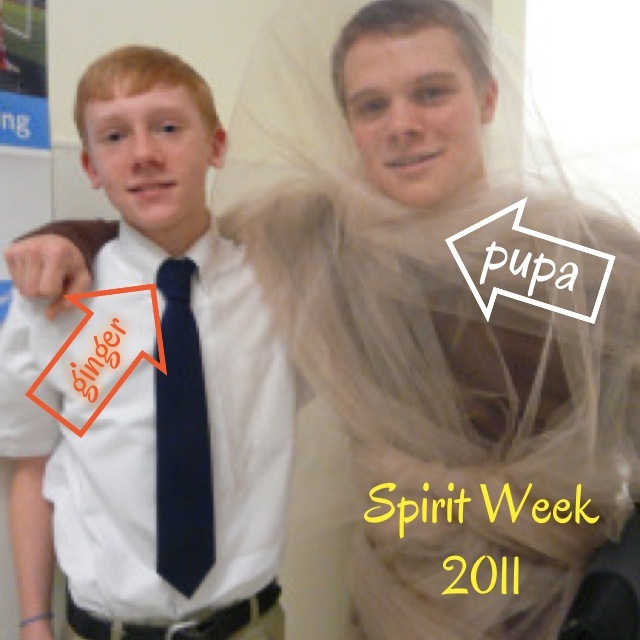 So how do you top being a pupa? 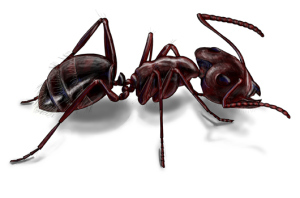 Well, we’re not sure but staying in the insect world, this year Aaron was a carpenter ant. My middle OS donned a hard hat with antennae, an electric drill and drill bit along with a tool belt. He also “grew” an extra pair of legs which I sewed last night. 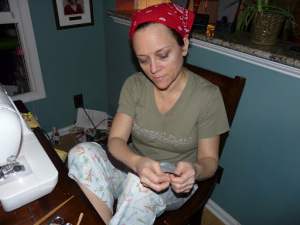 Here is proof that I am a great mother – making carpenter ant legs just before bedtime. There were many creative animal costumes. For example, Zack, Aaron’s best friend was a swan complete with a feathery behind that wiggled back and forth as he walked. Aaron will be a senior in high school next year. I’m already thinking of ideas. Just wait, the rest of the week is quite creative and unique also! PS. I just learned that Aaron and the science teacher were the only invertebrates in the school today! Wow, I’m even prouder now! The final theme for Spirit Week in middle school was TV characters. Again, my friend Michele and I masterminded what we believed would be the most epic of all ideas for TV character days not only at our kids’ school but quite possibly ever in the history of mankind. What we didn’t know was that there were other moms with some crazy ideas of their own. After kicking around a few ideas, we asked our boys what about being the international children’s Australian music group sensation, The Wiggles? To our surprise, our guys said yes! I was pleased that Ike was willing to be a Wiggle. He is my subdued child and far more self-conscious. Not only did Michele’s son and my boy decide on being The Wiggles but they recruited two of their buddies to be the two remaining band members! Michele and I went full-force with our plans. She bought t-shirts for all four of them and created The Wiggles iron-on transfers and expertly applied the logos to the front of each shirt. Then after lunch one day, Michele and I found black hairspray. When Ike came home, he was eager to try it out. I took him outside as to not make a mess indoors and put a few squirts of the black hairspray on his hair. His lovely orange hair began to turn the ugliest shade of gray I’d ever seen in my life. It turned a thick, lifeless gray and to make matters worse, the hairspray became powdery on his head. We also probably destroyed another ozone layer in the process. Sorry about that. The next morning Isaac woke early. After he put his Wiggles t-shirt on, I placed him in the tub and began lacquering his hair. A thin film of powder covered his head. Before my eyes, my sweet 12 year old son had turned into an aging Wiggle. I gave him some dark eyebrows with my eyebrow pencil and once he got the blue plastic recorder I bought at the Dollar Tree, Ike’s transformation was complete. Ike trepidatiously walked into the sixth grade hall searching for his aging band mates. Their moms had also bought the hairspray and they all complained about the gross stuff in their hair in the corridor. The hallway exploded with energy. One student was the Cookie Monster and he passed around cookies to everyone he saw. Another guy was the FreeCreditReport.com guy complete with a little pirate outfit and guitar. But I think my personal favorite TV character was Billy Mays from OxyClean! This student was a hoot because he absolutely personified spokesman Billy Mays. He had a penciled-in beard, toted around his OxyClean bottle and recited the entire OxyClean schtick! Ike said everywhere Derek went, he was trying to sell his product! Smiles and laughter, cookies and cleaning products, music and merriment, what could possibly be better! And then there was Aaron. The grand finale of high school Spirit Day was Crayon Day. Poor fella was clueless about what to do. After a long night of homework, Aaron began working on his costume after 11pm. Ingeniously, my middle OS turned a grocery bag inside out, grabbed some markers, a bottle of White-Out and my resourceful child became a box of Crayons. With little sleep, Aaron was pretty unpleasant the next morning. He was Mr. Grouchy Box of Crayons even in the car as these pictures clearly demonstrate. It probably didn’t help that his annoying parents took a million pictures and found the whole thing terribly amusing! 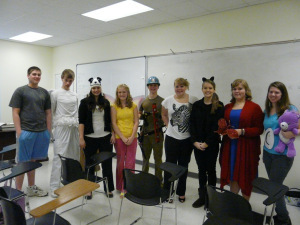 I miss Spirit Week but am kind of glad things are back to normal…I’m already thinking about next year’s plans! Now we’re back to our regular school uniforms and I admit I am both relieved that Spirit Week is over and nostalgic about the fun times we enjoyed. Aaron’s class had Black-Out Day. I wasn’t ecstatic about the theme since it seems dark (duh, it’s black!) and gothic but then Aaron wanted to know if I had any black tights and suddenly Black-Out Day sounded more weird than anything else. My OS would have killed me if I had taken some pics but you should have seen him trying on my stockings. At first he tried on a pair of black nylons. “How can anyone wear these things!” he groaned. When I saw that he was wearing nylons, like the kind I wear with a dress or skirt, I had to intervene. He needed an emergency hosiery alternative so I recommended some black tights. It is strange rifling through my drawers trying to find a hosiery alternative for my teenage son. I hearken back to the Halloween when my oldest OS was about six years old and dressed up as a spider. He wore my brimmed black hat and to complete the ensemble, I purchased some girls’ spider tights. I didn’t think it was a big deal but he did. It took a lot of convincing but my son who is a now a plebe at the United States Military Academy VERY hesitantly wore them for trick or treating. To my knowledge, he hasn’t worn ladies’ tights/nylons since that day. Aaron also decided that compression shorts were necessary and I’ll leave it at that. If guys only had a clue how much effort we put into looking good, I think they would be surprised. In addition to covering his shapely legs all in black, my OS donned a black ski cap, black UnderArmor and smeared black camo make-up over his face. Yes it was creepy, especially when I came to pick him up after school and he continued to wear the ski mask. He was talking normally about his day through the ski mask and it was creeping me out! I had to tell him to take it off just so I could drive. I am not only the mom of three sons, but I guess I’m the mom of Men in Tights and Men in Black.